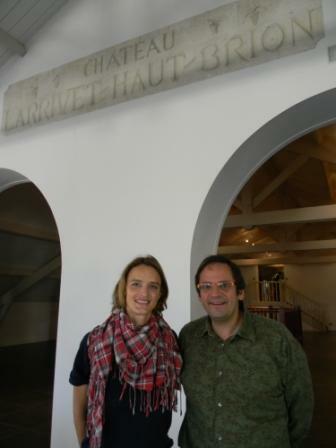 Many thanks to Marie-Stéphane Malbec of Lettres de Château for a press invitation to the Graves region in Bordeaux late last month. I tasted some well known wines in the northern part, known as Pessac Léognan (but also some unsung heros there), and some truly fine (and less expensive) wines from the southern part. 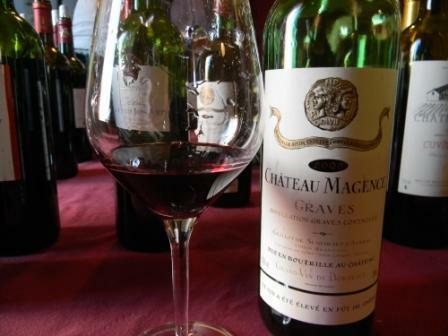 In the meantime, let’s get down to the tasting notes, divided into Graves and Pessac-Léognan Red and Pessac-Léognan White. Most reds were 2008s, most whites 2009s, unless otherwise noted. Peppermint nose. Nice spice, with subtle fruit. A fine nuanced attack, no hot thickness discernable. 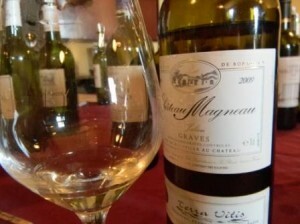 The palate is of medium intensity and serves as an excellent diplomat for white Graves in 2009. Early picking? (Latour Martillac) 92. Lime and lemon nose, some grapefruit. The palate is simple yet very pleasing. Almost tart. Could it have used a bit more richness? Will that come with aging. I say: YES. Based on experience… this is going to be a fine wine with time. (Couhins) 91. A wine to seek because it cannot be too pricey and yet… the nose is rather fresh Sauvignon and the palate is green apple and lime. Not a complex wine, but, again, to drink with seafood without hesitation. (Le Sartre) 91 Tasted again at dinner at the Bois Martin estate and confirmed: probably an excellent price/quality ratio. Chantegrive. Chipper and flavorful, good spice, oak derivation but integrated. Medium fruit. Some leafiness but pleasant, lends earthy freshness. Venus. Transparent and looks older. A bit of cardboard. Mid palate is OK but tails off on the finish. Le Bonnat. Another light and somewhat cardboard like flavor. Thin palate, lacking flavor intensity. Ho hum wine. Haut-Selve. Lovely nose, there is fine fruit, good attack, with sap on the mid palate, concentration that makes me wonder if it is almost trying too hard. At least it asserts itself, although a touch of heat. Ferrande. This is sometimes an under-performing estate but here a fine toasty nose, with a smooth palate entry, medium intensity, fine concentration (stuffing even), and a finish that is moderate but pleasing. Lusseau. Not a bad nose, but a hint of green. Mid palate is better than the attack, offering up a decent drink. Cabannieux. Fine fruit, chipper freshness, albeit with oak derivation and a tad warm, but pleasingly dusty tannins. Roquetailladela Grange. Here another recommendation, with fine floral nose and a medium intensity palate just integrating oak-derived notes into red fruit flavor. Haura. Made by Denis Dubourdieu. Aromatic. Attack that emphasizes stuffing, but smooth entry and mid palate feel. Just a touch of heat on the finish. Clos Floridene. Dubordieu’s flagship. Finesse on the nose. Red fruit on the medium plus intensity palate that is marked by very pleasing, almost crackling, cranberry. Mark of the vintage? Tannins are a bit edgy however… Give it some time. Haut Maray. Somewhat stolid nose that precedes a somewhat thick attack and entry. There is flavor and fruit but a tad … thick. And slightly hard tannin. Not sure. Magence. One of the very best reds of this tasting. It seems to have taken in the limits of the vintage and expressed the best possible wine: plum and cassis fruit, medium intensity, a smooth attack and mid palate, some cherry flavors on the finish, supple tannin. One to buy. Today. Clos Floridene 2009. Fine apple and grapefruit on the nose. Good freshness. Acidity is there, too. Not bad at all. Is the finish just a bit short? 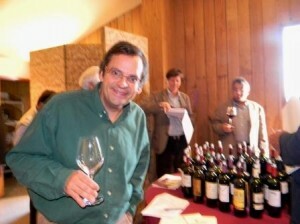 Ferrande 2010. A somewhat closed nose. Although the palate exudes stuffing, presence, I feel that it lacks brightness for the vintage. A disappointment. Roquetaillade la Grange 2010. This has … 20% Muscadelle and 60% Semillon. Very clear color, matching its youth. Somewhat floral aromas. Light yet flavorful on the palate. But I get the feeling that the finish is almost fleeting… Too polite? Chantegrive Cuvee Caroline 2009. I was expecting a lot and came away with heaviness and oak. 2009 was too sunny for this estate? Too warm? Alas, a deception. Cabannieux 2009. Better, less oak. Still, a certain thick aspect that informs you that this was too hot a vintage for Graves. Grand-Abord 2010. There is something a tad ho hum about this wine. I had visited the chateau just before this tasting and was impressed with the dynamism of the owners, but the 2010 lacks intensity and focus, although it is not bad. Magneau 2009. Tasted again at the estate the following day and I must say this is one of the best white 2009 Graves I have had. I did not take notes for some stupid reason…. The 2010 is even better. Terrific blog! Ill probably be citing some of this info in my next paper. I really loved this post. You write about this topic very well. I really like your blog and I will bookmark it! Keep up the super posts! Thank you Allene for your reading. I appreciate your interest. Will keep adding new stuff! Glad you like it Carlee, thanks for reading. Wonderful blog post. Thanks a lot for posting this. I was not aware of your site, but definitely will return back a lot more often at this point. Adding you to my own favorites.